Luminarias are the hallmark of Christmas in Albuquerque, and you can see them all over the city, from the University of New Mexico to Old Town and the Country Club neighborhood and the Indian Pueblo Cultural Center. Most of these places are also the scene of traditional annual holiday season events that get you in the spirit of Christmas. You can enjoy a tree-lighting, luminaria tours and shopping for New Mexico gifts. Many of the holiday events are free. The Old Town Albuquerque Holiday Stroll gets the holiday season started at 6 p.m. on December 7, 2018, with the annual lighting of the Old Town Christmas tree, accompanied by live entertainment and loads of shopping specials. 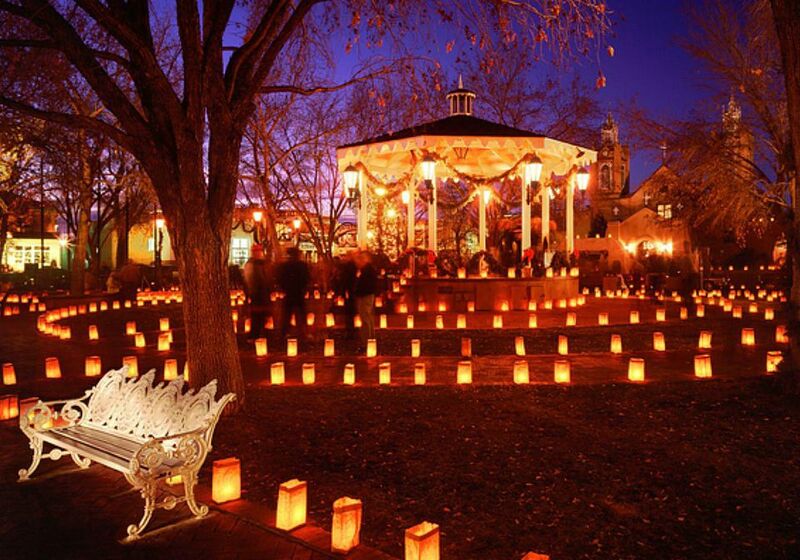 Streets will be closed and people will start gathering at 5 p.m.
Old Town is aglow every holiday season with luminarias, in itself a sight to behold and an Albuquerque tradition. Save the date for one of Albuquerque's signature holiday events, the Twinkle Light Parade on Dec. 1, 2018. Floats, bands, bikes, cars, and Santa himself will parade down East Central Avenue through Nob Hill from Washington Street to Girard Boulevard from 5 to 9:30 p.m. Pack up the kids, some warm clothing, hot chocolate, and some Christmas cookies and head out for an event with some real Christmas spirit. If you are on the hunt for traditional Native American gifts, head to the Indian Pueblo Cultural Center on November 30, 2018, from 5 to 8 p.m. for its annual Pueblo Shop & Stroll, lit by countless luminarias. You'll find handmade Christmas ornaments in clay, jewelry, and works of art. Have some hot chocolate by the bonfire as you experience a performance by the White Mountain Apache Crown Dancers at the end of the evening. This event is free with museum admission. One of the highlights of Christmas in Albuquerque is a tour of luminarias displays on Christmas Eve. Walk around the Old Town Plaza and venture into the Country Club neighborhood on Dec. 24, with stops for hot chocolate, carolers, and holiday cheer along the way. Other neighborhoods to try are Ridgecrest and North Albuquerque Acres. Enjoy the lights as soon as the sun goes down. The Hanging of the Greens at the University of New Mexico is its oldest student tradition, and it takes place in 2018 at 5:45 p.m. on November 30 at the UNM Bookstore. Carolers will move across campus to University House with a wreath for UNM's president. Then a reception will be held at Hodgin Hall from 6:30 to 8 p.m. Besides the caroling and the formal wreath presentation, UNM is the scene of a gorgeous and large luminaria display, not to be missed. The Belen Harvey House Museum, in Belen, about a half hour's drive from Albuquerque, puts on a spectacular light show every year for the holidays. It is lit with more than 300,000 lights and is decorated with vintage Christmas items, nativity scenes, and more than 100 Christmas trees. There are also treats to eat and music to enjoy. Bugg Lights is open every day from Nov. 24 through Dec. 30 from 5 to 9 p.m. If that's not enough, there will be live music and decorations of the season. Watch the Nob Hill Facebook page for the 2018 date. The tour, originating from the Downtown Convention Center, lasts about 45 minutes. Tour times are scheduled at 5:30 p.m., 5:50 p.m., 6:10 p.m., 6:45 p.m., 7:05 p.m., and 7:25 p.m. Tickets, which sell out quickly, are available through the link on the event website.